The water shortage in Vietnam is becoming serious, requiring management agencies to strengthen water sources protection. According to Deputy Minister of Natural Resources and the Environment Le Cong Thanh, 63 percent of total water reserves comes from outside the territory. Vietnam’s water security depends on development activities on international rivers – the Red and Mekong Rivers. Vietnam is a member of bilateral and multilateral cooperation groups for sustainable water sources development. However, it is now under pressure from water exploitation activities by countries in the upper course of the river. Within a country, water sources and river networks suffer the most visible effects from development activities. The demand for using water sources has increased rapidly, while measures to use water effectively have not been respected. In 2008, the Ministry of Natural Resources and the Environment (MONRE) released Decision 15 on protecting underground water resources. However, to date, only a few localities, including Hanoi, HCM City, Dong Nai, Long An, Binh Duong, Lang Son and Hung Yen, have set no-water exploitation zones. The disputes among localities and involved parties in sharing and using water sources is also a challenge to water security. According to experts, the biggest challenge now is an increase in population which has led to more demand for water in nearly all river basins of Vietnam. Meanwhile, climate change will make the situation even more serious. 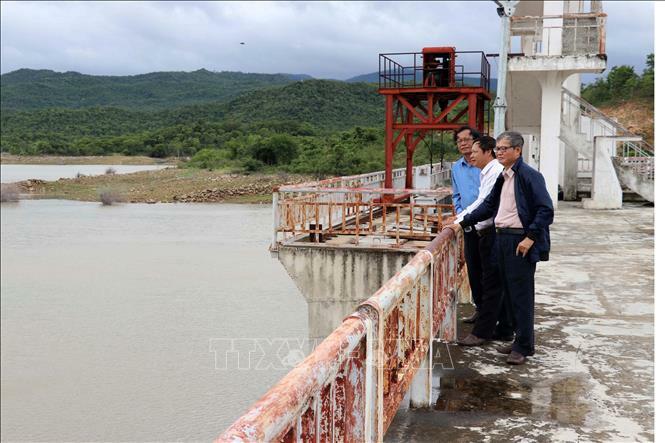 There are 29 water reservoirs in the entire province of Ba Ria-Vung Tau. Of these, landmarks have been placed in 16 out of 17 irrigation reservoirs. Natural and artificial lakes in residential quarters have been put under control of the agriculture department, to create protection corridors. This was put under management of district people’s committees at other reservoirs. Under the Water Resources Law, MONRE draws up an overall plan on surveying water resources and submits to the PM. Once the plan gets approval, provincial authorities create a plan to survey water resources in the locality. However, none of this has been done as the overall plan has not come out yet. As a result, state management over water resources exploitation faces problems because of insufficient data about water resources. Local authorities do not have information to allocate water sources for different purposes. To date, MONRE has granted 184 licenses related to the use of water resources, including 42 licenses to discharge waste water into waterway sources, and 27 licenses to exploit underground water.